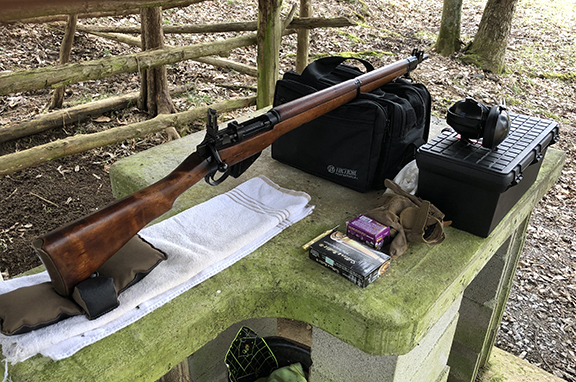 I was finally able to get to the 50/100 yard range with the Lee Enfield. I don't own a spotting scope yet and didn't feel like walking out to 100 yards over and over so I tacked my target at 50 yards. I think this was wise anyway because this is only the second time I have had this rifle out and am still tweaking in the sights. Please correct me if I am wrong but at the lowest setting the rear sight will only go down to 100 yards? Anyway, I pinned up a leaf and shot for that and seemed that elevation was good. I then made the slight adjustment to the front sight in the direction of error. I then started getting some pretty close hits. 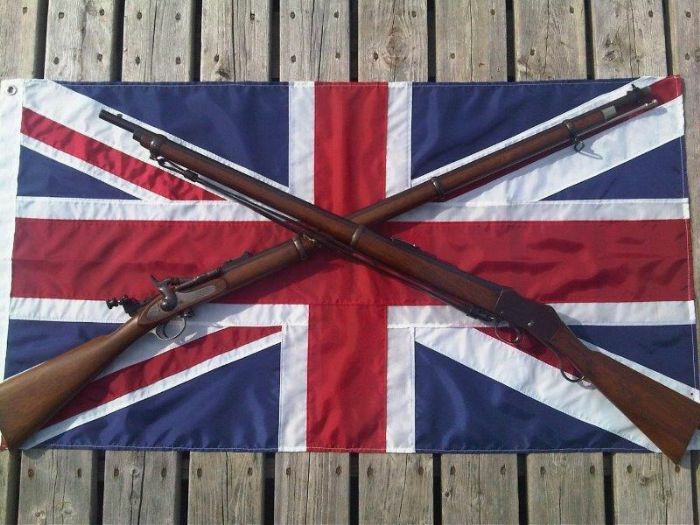 I am sure it will get better after I have more experience with this fine rifle. No functional issues or key-holing. Very smooth action. Any suggestions would be greatly appreciated. Donald. Looks like a good start to me. 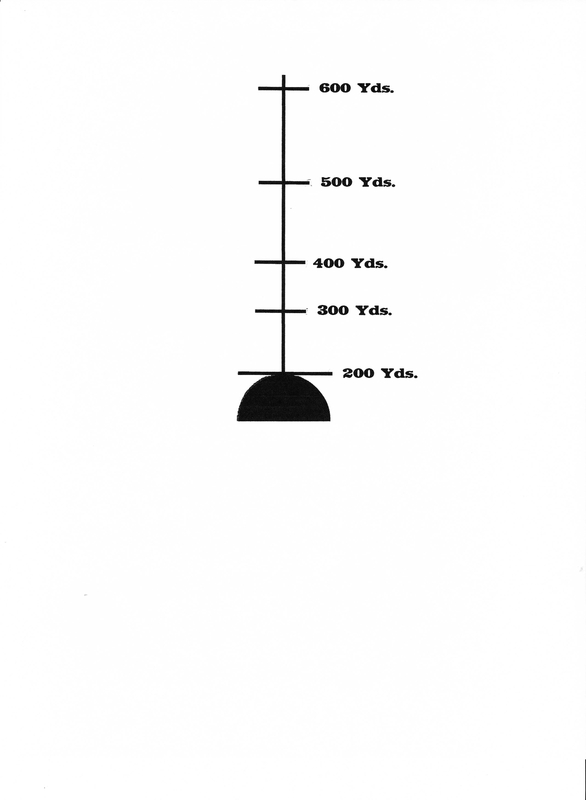 You should be slightly low at 50 as the round is still rising in its trajectory out to the 100yd mark if you're 4 clicks down from "2" with the ladder sight up. Technically it only goes to 2oo but you can "fake" 100 pretty well with the extra 4 clicks down. If the bad guys got close you switched to a "Dr Mills #36 Wonder Pill" (Guaranteed to cure whatever ails you) or a bayonet! Hi Shamu. I pinned the leaf and sighted on that. I am in the process of cleaning the Lee now and will take a look at the peep setting. I was using the smaller of the two holes. Other than that, any ideas why it would shoot high? Here is a photo of where I had the sight while firing at 50 yards. Perhaps to short of front sight? How people line their cheek up to a particular rifle can effect it also. When I shoot an unscoped Lee Enfield at the range, buddy always wants to try. Our bullets hit at different points on the target. You don't say what ammo you used, just that can make a difference. Not just weight of bullet & velocity but the way different powders can make the barrel's harmonic vibrations change. The groups look fine to me for a starter. the center of them is a hair low, which is exactly right. 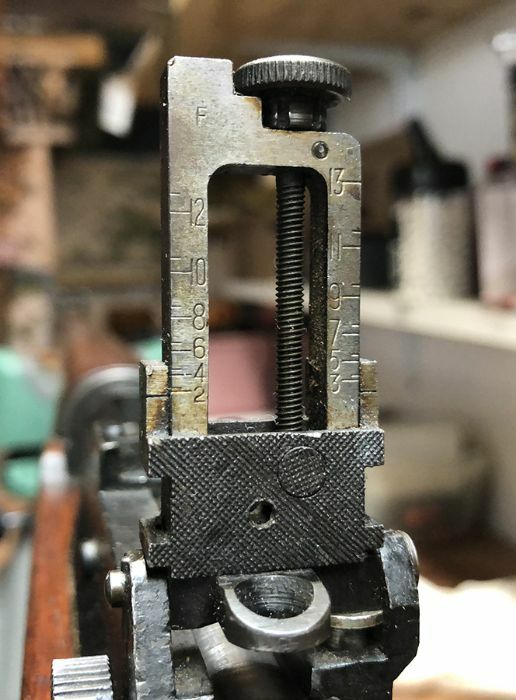 One thing that can help your sighting when using the Enfield sights; is ensuring you get the front sight ears well centred and consistently in the same spot when viewed through the rear dioptre. Finding the best distance for the viewing eye from the dioptre to get the front sight ears appearing to just contact the edges of the dioptre can help get a repeatable position; as you bring the front blade onto target. Gentlemen, thank you so much for the terrific info on this thread! I have a lot to work with now when I go back out there. I was using S&B ammunition as I had some I wanted to use up. Here's something you might find useful. just print it out on 8 1/2 X 11 paper & verify the measurements. What you do is sight with the top of the foresight blade just touching the flat bottom of the "mushroom" & set the elevation for the range you're emulating. (I'd suggest start at 200 with the rear sight on "2". If you're zeroed correctly the bullets will strike on the "2" bar of the ladder. Dimensioned if you want to verify print size, or make your own. Very nice info share. Going to print a few copies of those. Thanks. If you are shooting off the bench, rest the forearm behind the middle band, not in front, make sure it is in the same position on each shot. Make sure the main screw (front trigger guard screw) is tight. Align the top surface of the front sight vertically in the center of the rear sight apature. Also, center the front sight laterally in the apature. Make a habit of checking this front/rear sight alignment on each shot. Consistency is the key. Considerable aiming errors will result unless you maintain consistent sight alignment. Align the top surface of the front sight with the bottom of the black aiming mark on the target (6:00 hold, “pumpkin on a post” sight picture). Some may prefer a center of target hold. I can’t get consistent elevation with a center hold. I start with sights aligned low on the target and slowly raise the rifle muzzle until there is just a sliver of white showing between the front sight top surface and the bottom of the black aiming mark. Shooting prone, this is controlled by exhaling and stopping when the front sight has the correct alignment on the target. I have 4 Mk 1 rear sights, none of them will go more than 2 clicks below the 200 yd elevation mark. 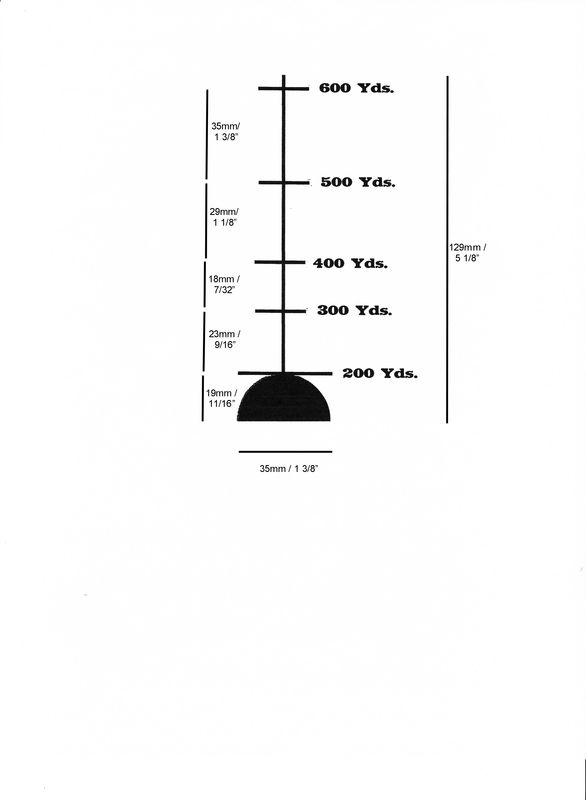 The elevation rise required for the Mk 7 bullet from 100 to 200 is about 2 MOA (two clicks). 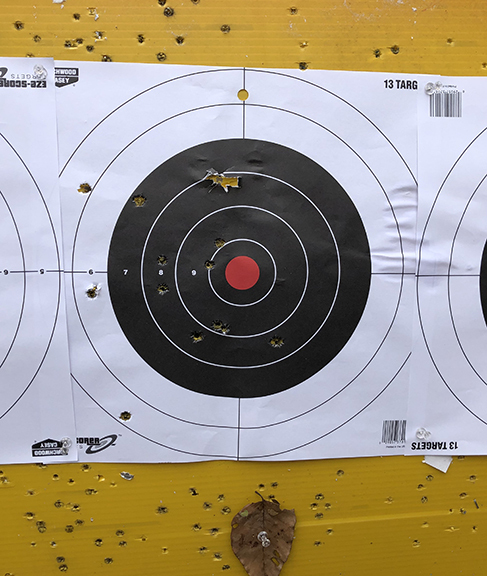 Your hits at 50 yds look fine to keep you on paper at 100 yds using the same sight settings. That's odd both of mine go 5 clicks? Take this and start at 200 yards.